I have 5 crabs. 3 are in molting tanks. 2 of them are slowly coming up. I put fresh water & food, then noticed loads of tiny brown bugs inside the food jar (original jar from store, always sealed, except when feeding). I'm scared, this is the jar I've used for weeks!! I've actually noticed unusually extra activity lately. I'm preparing new substrate but how can I know if crabbies are safe or not at this point ?? Any particular symptoms to look for ? OMG, these bugs can be anywhere by now !!! They are most likely grain beetles, which are harmless. Your crabs probably enjoyed eating them along with the food! I've had store bought dried items come already loaded with bugs before, even thought it was sealed tightly and bought at different locations. I actually froze mine and fed it, the crabs didn't care one way or another. However, if you take it back and raise a stink you should get a refund depending on the store. Hello! 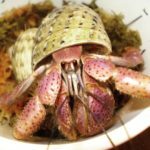 Why are your crabs in molting tanks? It really isn't necessary to move them for molting. Back in the day it used to be deemed that way, but if your substrate is the recommended depth (minimum 6" or three times the height of your largest crab (whichever is deeper trumps), and your tank isn't overcrowded - then your crabs should be able to molt in the crabitat. What is the food you are feeding? Some of the store bought ones have preservatives that are bad for crabs.